INDIANAPOLIS and WASHINGTON DC, January 30, 2019 -- Global Water Technologies (OTC: GWTR) and WatchTower Robotics will collaborate to test smart water/city solutions that improve efficiency in drinking water systems, the companies announced at the 2019 Capitol Hill Tech Demo Day in Washington DC. The companies signed a Memorandum of Understanding at the event and plan to research how smart cities communications platforms can be used to collect data from underground infrastructure, such as aging drinking water pipes where undetected leaks result in significant water loss. WatchTower Robotics has developed an innovative flexible robot that travels through water pipes to collect data and identify leaks and was recognized as a winner of the 2018 James Dyson Award. Global Water Technologies has been testing new communications systems, including LoRa technologies that transmit long range with low power. Initial testing of both took place in rural Southern Indiana last fall. 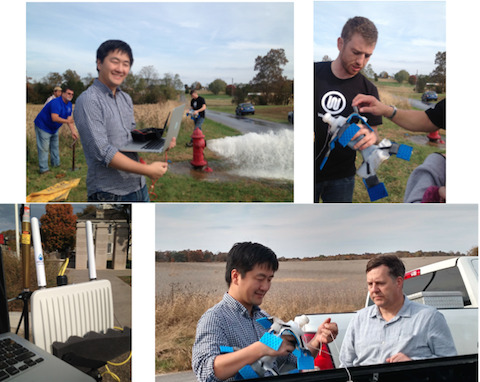 “New methods to solve old problems are driving innovation in the water sector,” said Tyler Mantel, CEO and co-founder of WatchTower Robotics with Dr. You Wu, who began development of the robot as his thesis at MIT after the two graduated from Purdue University. Additional testing of the technology solutions is planned in Indiana, which is being recognized for its dynamic tech ecosystem and state leadership with new initiatives like the Indiana IoT Lab and Indiana’s selection as the first statewide plan in the US EPA Water Infrastructure Finance and Innovation Act (WIFIA) program. Opening remarks at the tech event were presented from U.S. Representative Susan Brooks (IN-5) and Congresswoman Yvette Clarke (NY-9) who both serve as co-chairs of the Congressional Smart Cities Caucus. The 2019 Capitol Hill Tech Demo Day was organized by The Computing Technology Industry Association (CompTIA) and co-sponsored by the Congressional Smart Cities Caucus, the Congressional 5G Caucus, the Blockchain Caucus and the Congressional Technology Staff Association.